'Charles Norden', the author of Panic Spring, is really Lawrence Durrell. His first novel, Pied Piper of Lovers, published by Cassell in London, had not sold well; when his new publishers, Faber and Faber, suggested that his second novel, Panic Spring, appear under a pseudonym, Durrell based the name on Van Norden, a Jew in Henry Miller's Tropic of Cancer. The Faber edition appeared in 1937 and in the United States the novel was published by Covici-Friede in the same year. Neither sold well and copies are rare; a Faber copy in good condition will set you back many thousands of pounds and a good Covici-Friede edition will cost in the hundreds to a thousand or so; luckily my beaten-up copy cost a few quid. Nowadays nobody needs to hunt far and wide nor pay an arm and a leg for a reading copy; both Panic Spring and the earlier Pied Piper of Lovers have recently been published by ELS Editions in Canada. They make interesting reading. As the blurb I wrote for the cover of Pied Piper of Lovers says, the book 'introduces in nascent form themes, techniques and characters that Durrell will develop in his later novels. Not least intriguing are his protagonists Walsh and Ruth who will appear again in the streets of Alexandria, Athens and Avignon; their mysterious relationship, which lies at the heart of Durrell's creative urgency, is first explored here in Pied Piper of Lovers'. 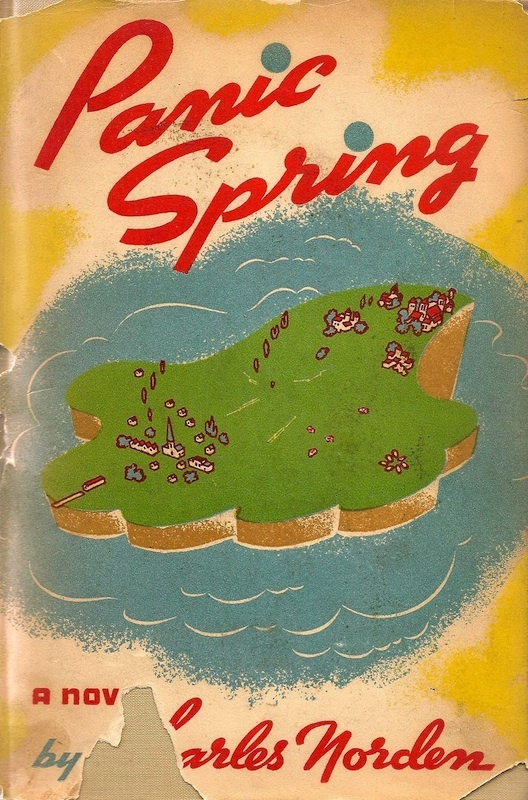 And, I should say, it is further explored in Panic Spring, set on a Greek island and written while Durrell was living in Corfu. Even reading the front flap blurb of the first US edition of Panic Spring is to sense the familiar, what will become fully developed in The Alexandria Quartet - for the island read the city, for Rumanades read Nessim, for his beautiful young mistress read Justine, etc. But apart from all that there is the inscription in my copy which has its own story to tell - just as the inscription in my first edition of A Passage to India that I mentioned in an earlier post also had its tale. 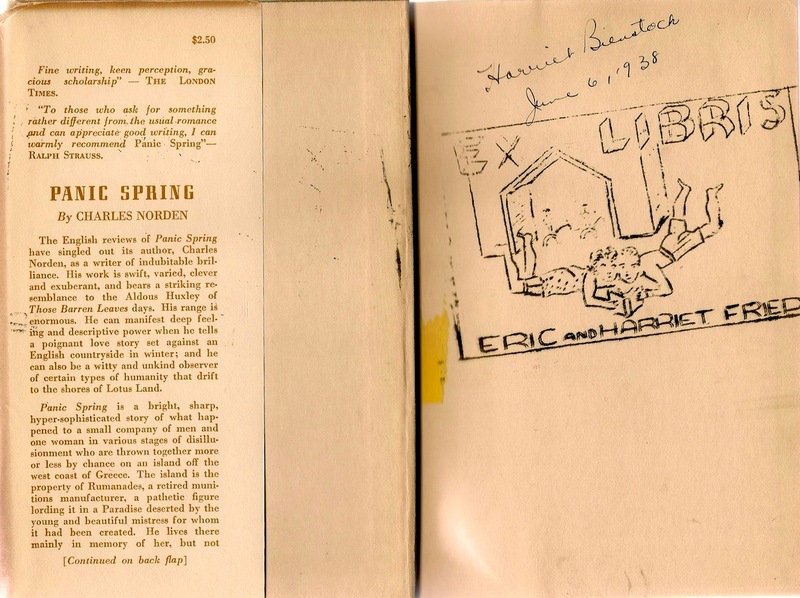 My copy of Panic Spring is signed by its owner Harriet Bienstock and dated 6 June 1938. 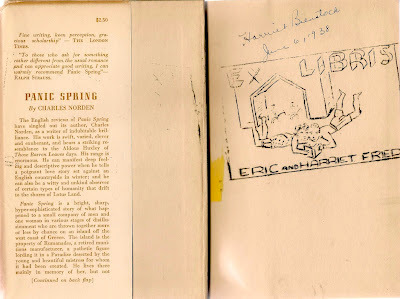 Later it is stamped with Harriet's ex libris device; she has married Eric Fried and among the pleasures of the loving young couple is to lie before a fire with nothing much on reading books such as Panic Spring. Ex Libris: Nothing much on. I was curious to know who this Harriet was, and what a nice girl like Harriet was doing reading this book by the unknown Lawrence Durrell. I discovered one other book recorded as having been owned and stamped by Harriet and Eric; it is in the library at Wake Forest University and is called Unholy Memories of the Holy Land by the English lawyer Horace Samuel and published in London in 1930 by Leonard and Virginia Woolf of the Hogarth Press. The book is a condemnation of British attitudes and policy towards the Jews during the Palestine mandate.